Our Belief Statement is what we stand for, what we are passionate about and what we aspire to. It's our reason to get out of bed in the morning and come to work, and the reason our company exists. It sets out our purpose and what we are here to deliver to our customers. We hold our Core Values close to our hearts. They are the foundation of who we are and how we conduct ourselves. They play out in all of our interactions; with customers, in Amcor workplaces and with our other important stakeholders. They guide us and act as our moral compass. Stelvin® the original wine screw cap developed more than 40 years ago, is the market reference. The Stelvin®screw cap uses specific liners that respect the ageing process and deliver uncompromised flavours and aromas. Amcor's premium Softgard tin capsule range conveys luxury. Softgard has a long tradition of supporting fine wines and spirits, distinguished by its appealing touch and weight. Intricate designs are possible thanks to Amcor's mastery of printing and embossing techniques. Softgard+ with tear-strip offers an elegant opening system for spirits. Capgard is a one-piece aluminium overcap that perfectly meets contemporary packaging needs by striking a balance between tradition and a demand for lighter materials. More affordable than tin, it offers the same visual appearance and premium design opportunities. Amcor's Rolltop capsule is ideal for the core wine and spirits market. It is easy to use on high-speed capping lines and enhances the product presentation thanks to its smooth finish. It offers multiple decoration possibilities that can be combined - embossing, hot stamping and 4-colour printing. The Rolltop+ capsule with tear-strip offers a clean and easy opening system. Light two-piece elegant capsule produced from aluminium foil for sparkling wine. Amcor's Champal capsule offers surface embossing which allows customers to create an individual look and feel for their brand. Amcor's Champaluxe capsule brings sophistication to your products thanks to a wide range of design possibilities including ultra smooth surface, surface embossing, different tie finishes, UV printing and hot stamping, and double hot stamping. Amcor's Champaluxe Soft Touch capsule offers a unique experience through its velvet touch. Evoking a sense of tradition and craftsmanship that is worthy of vintage wines, its luxurious, premium feel makes it â¤~almost too special to open'! Amcor's LuxÃ©tain capsule is always completely customised to your product needs. We focus all our know-how on helping to deliver on your brand promise. Through a wide range of graphic options, you can achieve anything from simple elegance to the height of sophistication. Amcor's Champtop premium capsule affords a very sophisticated appearance thanks to the smooth finish and preformed top that can be embossed. Customers' brands can be double hot stamped on the skirt for distinguished shadow effects. A choice of tops - flat or curved can provide further brand differentiation. By printing the tax stamp on the skirt, we offer additional design surface on the top of the capsule for more intricate designs. Champtop also offers a patented easy-opening system. Amcor employees and family members spent a Saturday morning touring the safety features of Amcor\'s plant, learning about CPR and participating in a Fire Extinguisher training. A new capsule design from Amcor is making wine easier to open, while preserving time-honored traditions that are important to discriminating aficionados. 29 January, 2019 - A new capsule design from Amcor is making wine easier to open, while preserving time-honored traditions that are important to discriminating aficionados. The EASYPEEL wine-opening system uses a one-piece aluminum capsule engineered to open wine bottles along a clean line, every time. Unlike other technologies that rely on pull tabs, EASYPEEL allows consumers and professionals to use traditional bottle openers. 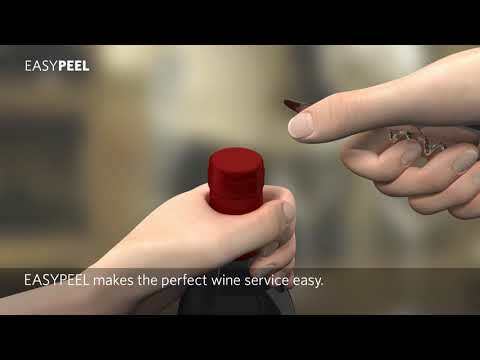 “We created EASYPEEL for everyone who loves wine,” explained Nicolas Freynet, General Manager, Amcor Capsules. “From people enjoying a glass with dinner to those serving dozens of bottles daily, everyone can now cut a perfect line, every time. With EASYPEEL, users place the knife from an opener at a point indicated on the capsule and peel back to create a clean and consistent opening. The improved design prevents tearing, over-cutting or removing the entire capsule – all of which can detract from the carefully crafted aesthetics wine brands work to develop. The system requires no design or manufacturing changes during the bottling process. Also, the aluminum capsules offer the elegance of tin at a considerably more stable price. EASYPEEL made its public debut on January 30 at the Unified Wine & Grape Symposium, Sacramento, CA. Amcor Capsules is a market leader specializing in the design and manufacture of capsules and closures for wine, sparkling wine and spirits. Amcor Capsules has plants in France, Canada, USA and Chile. Amcor (ASX: AMC; www.amcor.com) is a global leader in developing and producing high-quality, responsible packaging for a variety of food, beverage, pharmaceutical, medical-device, home- and personal-care, and other products. Amcor works with leading companies around the world to protect their products and the people who rely on them, differentiate brands, and improve supply chains through a broad range of flexible packaging, rigid containers, specialty cartons, closures, and services. The company’s more than 33,000 people generate more than US$9 billion in sales from operations that span about 200 locations in 40-plus countries. Come by our booth to enjoy special deals on selected STELVIN® stock colors! ‘’Our confidence in the quality and consistency of STELVIN® closures allows Heron Hill to focus on creating world class wines with Finger Lakes heritage for over 40 years. It’s really being embraced by our consumers at all our price points, up to our super-premium wines." | #DareSTELVIN - Eric Frarey, winemaker at Heron Hill Winery, USA. Diamond Estates Wines recently chose the Amcor Delite™ solution to launch their new 200 Ml single-serving version of Eastdell Wines. Fiona Bauchan and Tom Green explain why they chose the STELVIN® closure and the PET bottle for this extent of their brand. "Consumers seemed interested in the fact that we were using a screw-cap. We then educated them and let them know that aluminum closures can also be associated with higher-end wines. We choose STELVIN® to preserve the freshness and consistency with our wine and it always delivered what we required from a quality stand point." -Emma Garner | Winemaker at Thirty Bench Wine Makers, in Canada. 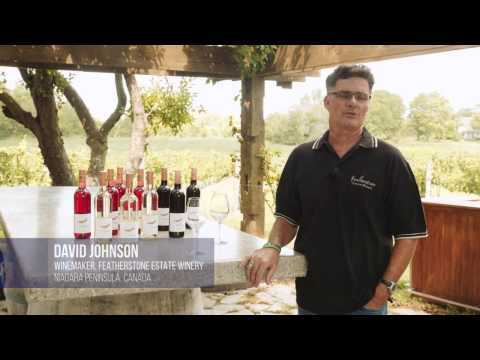 "We pride ourselves from our vineyards to the winery, to the wines we put in the bottle. We want to over deliver on the bottle the consumer takes home. By using the STELVIN®LUX on all our 11 McManis wines, we are achieving that!" Technology used to engrave aluminium STELVIN® closures with high quality, precision artwork is transforming brands and attracting consumer attention. Now, wine companies in North America can customise their closures with laser-engraving thanks to a partnership between global packaging leader Amcor – the manufacturer of Stelvin closures – and VinPerfect, a specialist closures company based in Napa, California, who developed the technology. “Customers can further customise their products with high-quality laser engraving that really makes their bottles stand out on the shelf,” said Frederic Catteau, Regional Director of Amcor Capsules, North America. “This decoration option is very attractive for customers of all sizes because there is no tooling set-up cost and lead times are short,” said Catteau. Customers can request customised laser engraving on orders as low as 1,350 closures, which is a unique offering in the closures industry. The engraving, which can be as small as fifty microns, delivers extremely detailed artwork on the closure top and is available on standard and custom-decorated Stelvin closures. Amcor bought the laser engraving decoration technology from VinPerfect and has installed it at the company’s site in American Canyon, California. Key winemakers have endorsed Amcor’s portfolio of STELVIN® closures, advocating the superior quality, technical performance and design flexibility of the products. Testimonials from prominent global vintners in both Europe and the US highlight the closures’ numerous benefits and their ability to maintain the purity and consistency of bottled wines. STELVIN® is a closure system specifically designed for wine, combining an aluminum closure, a specific BVS bottle neck finish, and a range of specific liners and closure conditions. The STELVIN® logo present on each closure guarantees the STELVIN® quality. Contact us for more information and testimonials. Ten years ago, Amcor Flexibles Capsules revolutionized the wine industry with a patented design for a premium wine aluminium closure solution offering convenience, elegance and style. Today, consumers, winemakers and marketers all over the globe are enthusiastically embracing what the STELVIN®LUX brings to the table in terms of a high-quality, repeatable opening that has elevated the consumer experience with wine. It’s no wonder that such groundbreaking technology has caught on. Amcor’s STELVIN®LUX incorporates a plastic insert that creates a completely smooth exterior and glass finish, allowing for infinite design possibilities. In addition, the aluminium closure is a sustainable solution – it prevents wine spoilage and is recyclable. Most importantly, the STELVIN®LUX is available with two different liners, enabling winemakers to control the levels of oxygen in the wine, mimicking the function of cork with none of the drawbacks. “The STELVIN®LUX keeps the flavors and aromas in the bottle just as the winemaker intended them to be,” confirms Neubauerova. Neubauerova emphasizes that Amcor Flexibles Capsules prides itself on guaranteed technical support for any bottling line equipment that needs to be adapted to the STELVIN®LUX. Neubauerova points out that brands from all over North America, South America, South Africa, Australia and New Zealand have eagerly incorporated the STELVIN®LUX closures into their portfolios, especially as millennial consumers continue to express their preferences for luxury wines with easy accessibility. For more information, contact our office at (707) 257-6481 or email info.capsules@amcor.com. Imagine that you are about to purchase a case of very fine wine from Burgundy to add to your growing wine cellar. Since your prize had to travel far to reach you and passed through many hands, also imagine that you possess a foolproof method of verifying the authenticity of its contents without engaging the services of an expert. 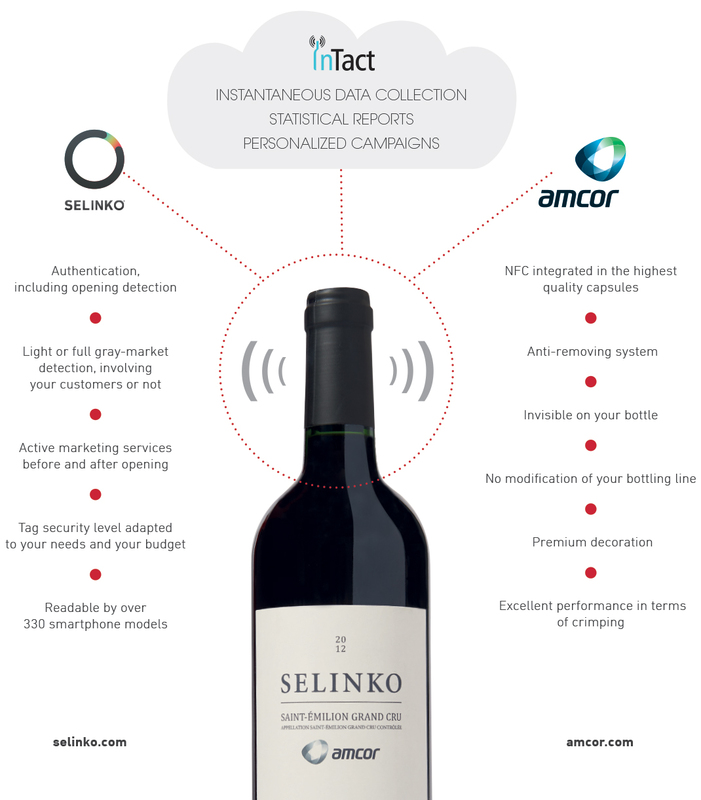 Such security is as close as your smart phone, thanks to an exciting partnership between AMCOR Flexibles, a global leader in providing worldwide packaging solutions, and Selinko, one of the industry’s leading developers of anti-counterfeiting, traceability and consumer engagement services. 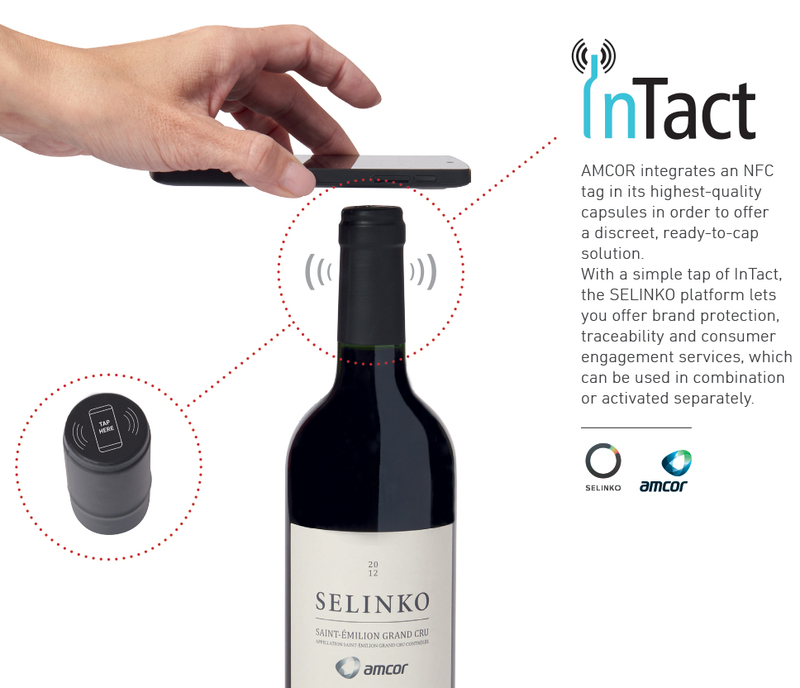 The innovation is known as InTact, the name for a line of capsules containing NFC (Near Field Communication) tag that is capable of transmitting data about whether a bottle has been previously opened and resealed, as well as a host of other information about the beverage and its producer. According to AMCOR Communication Manager, Lucie Neubauerova, InTact is an important breakthrough for wineries and distilleries subject to counterfeiting and ‘gray market’ practices around the globe. InTact works through a NFC chip installed within the capsule that interacts with an Android smart phone held near the neck of the bottle. One of the antennas in the chip will report whether the bottle has been tampered with. The other, once the bottle has been purchased and opened, can engage the consumer with personalized marketing messages designed to promote a closer association with the brand. Housed on Amcor’s new dedicated STELVIN website, the comments show other winemakers and bottlers exactly what they can expect if they make the switch to STELVIN. Amongst those to endorse Amcor’s closures are Bernard Ott from Weingutt OTT (Austria), Dr Martin Tesch from Weingut Tesch (Germany) and Kevin Willenborg from Vina Robles Winery (USA). For more information about Amcor’s STELVIN closures, visit www.stelvin.com. For more testimonials visit STELVIN®’s Facebook and Twitter pages. Amcor Capsules is a market leader specializing in the design and manufacture of overcaps and closures for wine, sparkling wine and spirits. Amcor Capsules has plants in France, Canada, USA and Chile. STELVIN® is a trademark of the Amcor Group. Amcor is proud to have been awarded an Alufoil Trophy 2016 in the Technical Innovation category for LuxPrem+, an innovative overcap solution for premium spirits made from a special aluminium based material. Developed in-house by Amcor, the overcap’s intricate design features ensure that LuxPrem+ rivals the traditional tin overcap used by premium spirits brand owners. In addition to offering visual sophistication and on-shelf impact, LuxPrem+ opens smoothly and is reassuringly substantial once the bottle has been opened. When designing the LuxPrem+ overcap, Amcor’s R&D team chose to use aluminium for a variety of reasons, including its material thickness, which offers the same easy open benefits as tin overcaps, as well as its excellent online crimping performance, which ensures a superior quality finish on the bottle. Plus, the aluminium allows for the printing of intricate designs to create a strong brand identity and visual impact. Using aluminium also offers economic advantages over tin. As well as the Technical Innovation award for LuxPrem+, Amcor Flexibles won two further Alufoil Trophies. The company’s AluFix® Retort Pro membrane for Emmi’s ‘All in One Fondü’ topped the list for the Consumer Convenience award, while Formpack® Ultra, a new cold form blister product, triumphed in the Resource Efficiency category. From the famous wine producers of Bordeaux and Burgundy to contemporary brands throughout North America, AMCOR has been the premier producer of high-quality tin capsule solutions for more than 150 years. AMCOR’s historic St. Seurin-sur-I’Isle plant in southwestern France continues to be the major site for the company’s state-of-the-art, customized, tin capsule production. AMCOR prides itself on its superior products and workmanship as well as its guaranteed, on-time delivery to customers around the globe. Riggan points out that AMCOR’s seamless, single sheet design offers wineries premium brand imaging that is enriched through a variety of finishes such as : matte, wax, satin, powdered or glossy varnish. She explains that in addition to their ability to adapt to any type of bottle design, the tin capsules can be formulated with anti-counterfeiting features to prevent imitation or copy theft and fully protect the brand. AMCOR also leads the industry with its “7 days/7weeks” guarantee. Specifically, AMCOR promises that for almost any custom tin capsule project, the company will turn around the artwork and color match within seven days and deliver the finished product within seven weeks. The guarantee and products are coupled with an excellent technical support team, which employs the most rigorous testing procedures to ensure that bottling runs smoothly. Amcor is proud to have received a WorldStar 2016 award for STELVIN® Inside, a new range of aluminium wine closures and liners that can double wine makers’ Oxygen Transmission Rate (OTR) choices. Each of the four liners has a different OTR target which, through technical developments in combination with other materials that make up the liner, ensures a controlled level of oxygen dispersion, so allowing wine makers and consumers consistency from one bottle to the next. Liners are highly complex and play a pivotal role in aluminium closures for wine. They guarantee absence of cork taint, ensure consistency from one bottle to another and secure the preservation of aromas, flavours and freshness as well as controlled OTR, which is critical to the wine ageing process. All the films used in the liners are produced by Amcor and are PVDC-free. In addition to winning its own award for STELVIN® Inside, Amcor was involved in the development of Lipton’s ultra-lightweight hot-fill package, which was also recognized by the WorldStar judges. Amcor Flexibles won two further awards for groundbreaking pharmaceutical and medical packaging concepts. People have been intrigued by aluminum closures ever since they first appeared in the 1960’s as a convenient, easy to open and reclose alternative to cork. More than fifty years later, today’s Stelvin® caps are revolutionizing the beverage closures industry through a technology that is giving winemakers an array of choices unimaginable just a few decades before. In 2013, Amcor Flexibles introduced Stelvin® Inside, an innovative range that focuses on the pivotal role of the liner in terms of the control of oxygen transfer and reducing the environmental impacts of its packaging. Stelvin® Inside offers winemakers four liners with four different levels of breathability: 1O2, 3O2, 5O2 and 7O2. Stelvin® Inside, exclusively for Stelvin® closures is the only complete closure package that provides high, medium and low barrier permeability, increasing the winemaker’s choice. In addition, the liners are devoid of PVDC*, which makes them chlorine free. Amcor is permanently looking for ways to improve their products environmentally, so the new liners have been developed using alternative non-chlorine technologies. *Some companies and countries (Germany) have concerns about chlorine in plastics (PVC & PVdC) as it is more difficult to recycle than other materials such as PET and may contaminate the recycling stream. Amcor Flexibles Europe, Middle East and Africa (AFEMEA) today announced it has completed the acquisition of Nampak Flexible, the leading flexibles packaging company in South Africa. In combination with Amcor’s current business in Africa, the closing of this deal makes Amcor the leading flexibles player in the African market with a total net sales in the region of approximately €250 million (US$ 280 million). The acquisition includes four manufacturing sites and one sales office located across South Africa and generates a net sales of approximately ZAR 1.1 billion (USD 94) million per annum. They will join the Amcor Flexibles team as a new business unit, Amcor Flexibles South Africa (AFSA). AFSA will provide customers with broader product and technology offerings, increased innovation and development capacity, and a more versatile manufacturing footprint in Africa. Going forward, customers will benefit from improved choice, quality, service and security of supply. Amcor has a successful track record in integrating new businesses, and we are now focussed on ensuring a seamless integration that will create an exceptional business in Africa, focused on creating value for shareholders and customers. With 61 plants in 21 countries, Amcor Flexibles Europe, Middle East and Africa, a division of Amcor, is a market leader and the world’s largest supplier of flexible packaging. We deliver innovative packaging solutions and provide enhanced quality products for the food, beverage, pharma, personal care, medical and industrial markets. Our award winning approach towards sustainability makes us the preferred partner for customers looking for responsible packaging solutions. For more information visit www.amcor.com. Amcor Flexibles is proud to be the recipient of three coveted Alufoil Trophy 2015 awards organised by the European Aluminium Foil Association (EAFA). Demonstrating Amcor’s ability to offer the highest quality in innovative and creative packaging solutions, Amcor Flexibles is proud to be the recipient of three coveted Alufoil Trophy 2015 awards organised by the European Aluminium Foil Association (EAFA). In the category of Product Preservation, Amcor Flexibles, together with its partner Sandoz International, was awarded an Alufoil Trophy for AirFluSal® Forspiro® , a new respiratory inhaler for people suffering with asthma/COPD. Amcor Flexibles was asked to design a blister strip to ensure a longer shelf life of the powder in the AirFluSal® Forspiro®inhaler. The strip protects the inhalation powder from moisture ingress and also improves performance during transportation and release of the powder from the cavity. By removing the aluminium blister strip at the end of the day in the feedback window, the patient can check whether the prescribed number of inhalations has been taken. Head of the judging panel, Jean-Paul Duquet, Global Packaging Eco Design Manager of Bel Group, explained what impressed them, “This is a complex device and all the components had to be carefully combined to achieve the required performance. It is clear that the protection of the active ingredient – a hygroscopic powder – is entirely due to the innovative use of the aluminium foil in the blister strip.” “The powder is readied for release when the lid foil is pierced and upon inhalation the airflow transports the powder out of the cavity through the holes,” he added. By using a novel seal layer between its Formpack® base and blister lid foil, Amcor has been able to reduce the potential for moisture ingress via cross diffusion by 50%. Amcor Flexibles was also awarded an Alufoil Trophy 2015 for Technical Innovation for STELVIN® Inside, a new range of aluminium wine closures and liners that can double wine maker’s Oxygen Transmission Rate (OTR) choices. Each of the four new liners has a different OTR target which, through technical developments in combination with other materials that make up the liner, ensures a controlled level of oxygen dispersion allowing wine makers and consumers’ consistency from one bottle to the next. Liners are highly complex and play a pivotal role in aluminium closures for wine. They guarantee absence of cork taint, consistency from one bottle to another, preservation of aromas, flavours and freshness and controlled OTR which is critical to the wine ageing process. All of the films used in the liners are produced by Amcor and are PVDC-Free. Two of the four new liners also contain layers of aluminium foil. OTRs are offered between 1 O² and 7 O². In the category of “Resource Efficiency”, Amcor Flexibles was awarded an Alufoil Trophy for Canseal Pro, a direct-seal aluminium membrane for can ends. The membrane reduces total packaging material and cost, since it is directly sealed onto a can so no additional metal ring is needed. Canseal Pro offers a safe and convenient closure, with excellent seal integrity, outstanding barrier properties, easy peelability and highly efficient processability. Thanks to the excellent barrier properties offered by aluminium foil, Canseal Pro is currently being used for dry products that do not need heat processing after filling, as well as for other products such as condensed milk. “This is an excellent solution in a high volume packaging product, which can have a substantial impact on the amount of material used, as well as performing well across other functions,” said JeanPaul Duquet, who headed the panel of judges which chose the winning entries. “We viewed it as a potential ‘game changer’ for this type of can product, as sealing times could be reduced and better line speeds achieved, offering resource efficiencies in these areas too,” he added. The coextruded sealing structure of Canseal Pro is made especially for a newly developed direct sealing technology, based on inductive heating of the can body. The composition of Amcor’s polymer coating on the aluminium foil enables this kind of sealing process with reliable seal integrity. For a typical 73 mm diameter can, 1,000 conventional steel EOE lids weigh around eight times more than the equivalent Canseal Pro lids. “We are delighted to receive this trophy as recognition of our continuous focus to improve convenience and reduce the total packaging cost of our customers' products. Canseal Pro is another success story resulting from our strong cooperation with machine manufacturers and customers. Together with Alufix®, our range of easy-open aluminium membranes for cans,Canseal Pro further strengthens our offering in this market,” explained Sven Bauer, Product Development Engineer at Amcor Flexibles Europe & Americas. Two leading packaging suppliers, Amcor Flexibles Capsules and Maverick Enterprises, Inc. will further strengthen their position in North America through the creation of a manufacturing and sales partnership. The two companies will combine their extensive knowledge and experience in the manufacturing of polylaminate, PVC & sparkling foils for the North American wine and spirits market. Both companies have been producing locally in close proximity to the wine industry for more than twenty years and are renowned for quality and speed of service. The partnership will see a consolidation of manufacturing assets for the production of polylaminate and PVC capsules for the wine, sparkling and spirits markets at Maverick’s facility in Ukiah, California. Amcor Flexibles Capsules will continue to sell capsules under the Amcor Brand, produced in partnership with Maverick Enterprises. “Our local sales team in American Canyon will be able to offer a much deeper range of products meeting all our customer needs thanks to the enhanced portfolio that this partnership with Maverick Enterprises brings” enthused Frederic Catteau, Plant General Manager, Amcor Flexibles American Canyon. “Our plant in American Canyon will remain strong in Stelvin®+ closure production to support the growing market of screwcaps. Amcor Flexibles American Canyon looks forward to seeing you at the 3rd North Coast Wine Industry Expo! Use our promo code, AMC131 to reserve your spot today and visit us at Booth #131. Promo code must be used for online registration only. To register now click here! Average aluminium closure recycling rate in Europe hits 45 per cent. - Even though small in size, aluminium closures are widely collected and recycled – either separately with other packaging or together with glass bottles. - Recycling of aluminium needs up to 95% less energy than its primary production. Düsseldorf, October 2014. Due to improved collection and recycling in various European countries the average aluminium closures recycling rate is now at 45 per cent. Aluminium recycling saves up to 95% energy use compared to its primary production, with the corresponding savings in greenhouse gas emissions. It can be recycled over and over without any loss of quality. Amcor Flexibles introduces MyCoiffe –a service that redefines speed! How to develop a service that redefines speed? How to enable our customers to personalise their overcaps, yet still ensure they are available in less than two weeks? Our team in Amcor Flexibles Mareuil sur Ay embraced this challenge and the result is MyCoiffe – a revolution in the world of Champagne and sparkling overcaps. The MyCoiffe product configurator is presented electronically on a pad. Customers can use the configurator to create their overcaps choosing from a range of different models and options including personalized text, selecting a typeface and overcap colour and refining with ink embossing. Artwork is approved immediately on-line and customer service contacts the customer within 24 hours. With a service that redefines speed, Amcor Flexibles is pre-empting customer’s needs for exclusivity and quick turnaround. MyCoiffe: Imagined, Created, Delivered. Amcor Flexibles Capsules, part of the Amcor Flexibles Europe & Americas business group, is a market leader specialising in the design and manufacture of overcaps and screw caps for wine, sparkling wine and spirits. Amcor Flexibles Capsules has plants in France, Canada, USA and Chile. Since its launch at the 2013 Unified Wine and Grape Symposium, Stelvin® Inside has been recognized with two awards for its innovative technology: the “New Technology” award at the coveted 2013 SIMEI-ENOVITIS Innovation Challenge in Italy and the “Winnovation” Award at the North Bay Business Journal’s first Wine Industry Awards. “Expanding the range of liners available under Stelvin® closures increases a winemakers’ control over their wine. With four targeted OTR levels, winemakers know exactly how much oxygen will interact with their wine daily which ensures consistency from bottle to bottle.” said Frederic Catteau, General Manager of Amcor Flexibles American Canyon. As the manufacturer of the original Stelvin® closure, Amcor Flexibles is proud to have received multiple inquiries, client tests and orders of Stelvin® Inside throughout Europe and North America. Stelvin® Inside will be show-cased at Amcor’s Booth, #1710, at the Unified Wine and Grape Symposium from 28th-31st January. Stelvin ® Facebook & Twitter followers will also be delighted to discover a brand new clip that will be launching on the first day of Unified. Catch up by viewing the three existing clips on http://www.youtube.com/user/StelvinScrewcaps and come and discover ‘The Duel’ at Unified! Amcor Flexibles Capsules, part of the Amcor Flexibles Europe & Americas business group, is a market leader specialising in the design and manufacture of overcaps and closures for wine, sparkling wine and spirits. Amcor Flexibles Capsules has plants in France, Canada, USA and Chile. Stelvin® Inside wins a prize for “New Technology” at the 2013 SIMEI – ENOVITIS trade fair! Amcor Flexibles has won the prize for “New Technology” at the coveted 2013 SIMEI-ENOVITIS Innovation Challenge. On 12 November, the technical and scientific committee presented the award for excellence in innovation to Amcor during the official opening of the 25th exhibition in Milan. Amcor Flexibles Capsules, the pioneer of Stelvin® aluminium closures won the prize for Stelvin® Inside, a brand new range of four liners for wine, launched in January 2013. Each of the four new liners has a different OTR (Oxygen Transmission Rate) target. The Stelvin® Inside range doubles winemaker’s OTR choice giving them far more tools to help craft and perfect their wine. Each liner ensures a low level of oxygen dispersion allowing wine makers and consumers consistency from one bottle to the next. "Amcor Flexibles Capsules is extremely proud to receive this award for Stelvin® Inside. It marks a significant moment in the history of Stelvin® closures for wine – a contemporary solution which has been around for more than 50 years” said Nicolas Freynet, General Manager, Amcor Flexibles Capsules. From 12 to 16 November, Stelvin® Inside is present at the SIMEI-ENOVITIS trade fair on Paolo Araldo’s Booth C11D12 – Hall 11. Paolo Araldo is the distributor for Amcor Flexibles Capsules in Italy. Amcor’s Stelvin® wine screw caps – small, beautiful and highly recyclable! 14 February, 2013: Amcor Flexibles, owner of the original screw cap brand Stelvin®, is proud to be an active member of EAFA (European Aluminium Foil Association) Closures Group and to have contributed to the ‘Aluminium Closures – Turn 360º’ pan-European promotion campaign launched by the Group last November 2012. The aim of the campaign is to enhance public awareness about the advantages of a state-of-the-art closure form with sustainability credentials. What percentage of aluminium wine screw caps is actually recycled today?” is the question Stelvin® consumers frequently ask. Throughout Europe on average 40% of aluminium screw caps are currently recycled. Depending on the collection and sorting infrastructure in place recycling rates for screw caps vary and can range from over 80% in Germany to about 40-50% in countries like the UK and Italy. Countries with relatively small market shares might already recycle 20-30% of all aluminium screw caps. The recycling rates are calculated on the basis of publically available national aluminium recycling rates and market data from EAFA member companies. The advantage of aluminium screw caps is that they are collected either in mixed packaging recycling schemes or together with the glass collection stream. Despite their small size, aluminium screw caps collected together with mixed packaging material are readily separated with eddy-current systems. Similar systems are also used to completely separate the screw caps in the glass packaging fraction. This is due to the production requirements in glass recycling. The value of the recycled aluminium supports the economics of the recycling process of both material routes. Once separated, the aluminium closures go into the aluminium recycling stream for re-melting to be used again for other valuable aluminium products. Amcor Flexibles will continue to support the promotion of the ‘Turn 360º’ campaign and brings considerable sustainability expertise to the EAFA Closures Group. Amcor Limited is a global leader in responsible packaging solutions, employing more than 33,000 people worldwide, operating in 42 countries across 300 sites. Amcor supplies a broad range of plastic (rigid and flexible), fibre, metal and glass packaging solutions to enhance the products consumers use in everyday life. Amcor also provides packaging-related services that help customers succeed through collaboration and innovation driven by art and science. Amcor is headquartered in Melbourne, Australia and is listed on the Australian Securities Exchange. For more information visit www.amcor.com. The European Aluminium Foil Association is the international body representing companies engaged in the rolling and rewinding of alufoil and in the manufacture of aluminium closures and alufoil containers as well as of all kinds of flexible packaging. Its more than 100 member companies are based in Western, Central and Eastern Europe. Founded in 1974, it has its roots in associations dating back to the 1920s. Increasing wine makers choice - Amcor Flexibles presents Stelvin® Inside! Today, Amcor Flexibles Capsules, the pioneer of Stelvin® aluminium screw caps and liners for wine, is proud to announce the launch of Stelvin® Inside: a brand new range of four different liners for wine. This marks a watershed moment in the history of screw caps for wine as the new range doubles wine maker’s OTR (Oxygen Transmission Rate) choice giving them far more tools to help craft and perfect their wine. Thanks to Amcor’s proven experience with Stelvin® combined with – unlike any other screw cap manufacturer – our extensive film know-how as global leader in flexible packaging, we are perfectly poised to bring the new range of liners to market. The new Amcor Stelvin® liners were developed by Amcor. All of the films used in the liners are produced by Amcor and are PVDC-Free. The liners themselves are manufactured exclusively by our development partner MGJ, a leading container seal specialist. Each of the four new liners has different OTR target which thanks to Amcor’s film know-how ensures a low level of oxygen dispersions allowing wine makers and consumers consistency from one bottle to the next. The four Stelvin® Inside liners will be presented for the first time today at the Unified Wine & Grape Symposium, Sacramento (CA) at the Amcor Booth #1610. Amcor Limited is a global leader in responsible packaging solutions, employing more than 30,000 people worldwide, operating in 40 countries across 300 sites. Amcor supplies a broad range of plastic (rigid and flexible), fibre, metal and glass packaging solutions to enhance the products consumers use in everyday life. Amcor also provides packaging-related services that help customers succeed through collaboration and innovation driven by art and science. Amcor is headquartered in Melbourne, Australia and is listed on the Australian Securities Exchange. Innovation : Amcor Flexibles creates LUXPREM, a prestigious capsule for Champagne and sparkling wines. Amcor Flexibles is proud to introduce LUXPREM, a prestigious capsule for Champagne and sparkling wines. LUXPREM strengthens the Amcor Flexibles Capsules extensive range of capsules with its technological know-how bringing a new approach to luxury. sophisticated personalisation of the capsule. with an extremely premium quality capsule. Amcor Flexibles Capsules business is committed to researching high-performance solutions for its customers and continues to invest in new technologies and innovations. It offers a broad range of products with printing and finishing options that consistenly satisfy customer quality and service markets. Amcor presented LUXPREM exclusively at the Viti Vini trade fair at Epernay (France) from 17 to 20 October 2012 where visitors showed a lot of interest in this new and innovative packaging solution. There are currently two different liners on the market offering two different levels of oxygen barrier. Saranexâ"¢ and Saranâ"¢Tin. Thanks to Amcor's proven experience with Stelvin® combined with our extensive film know-how as global leader in flexible packaging, Amcor is launching Stelvin® Inside* a brand new range of four different liners which double wine makers choice. Stelvin® Inside is the only wine closure solution offering low, medium and high barrier permeability. All of the films used in the liners are produced by Amcor and are PVDC-Free. The liners are manufactured exclusively by our development partner MGJ, a leading container seal specialist. *Stelvin® continues to be available with Saran™ Tin and Saranex™ liners in addition to the Stelvin® Inside range.